Islamorada Fishing Reports have been including lots of action as of late, with a big variety of fishes. Tarpon fishing in Islamorada is heating up as it warms up and we get into 'spring and summer mode' here in the Keys! Florida keys fishing trips into the backcountry flats areas have been producing a mixed bag of fish, and when warm many of these fish are showing up on the flats and shallow areas where smaller skiffs can find them. Snook on the shorelines and beaches can be a good bet especially with live bait such as finger mullet or pilchards, and shrimp works especially well after a good cold front. Summer time the snook fishing really heats up when the spawn starts, usually in later May. Good news for the florida keys fishing report! The patch reef fishing has been decent, with plenty of action and good eats with hogfish, snapper, porgy, grouper, and cero mackerel. That wills low down as we get later into the spring. Trout, ladyfish, jacks, and the occasional pompano school can be found in the channel run-offs, and when warm in the open bays too. Trout fishing will get better and better and summer is usually a great time for that. On the offshore islamorada fishing charters sailfish fishing is slowing down and the dolphin (mahi mahi) are heating up. Tunas can be found offshore on the humps still throughout the winter. Wahoo are sometimes found further offfshore of the reef. 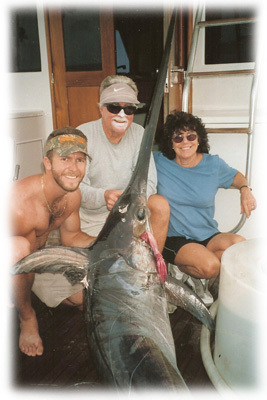 Swordfish fishing is possible through the spring when it's not too rough, and summer it starts to get much better - don't hesitate to call and ask about it! They are a blast when fishing in the Florida Keys! 305-664-2461 or 1-800-742-7945 or Islamorada Fishing Charters! Florida Keys Fishing Reports - Click here to jump to our fishing reports! HELP SUPPORT THIS SITE - CLICK HERE! I know it's been a while since we have updated everyone on our furry friend "Lil' Bud", so here's the latest report. He healed up to what we believe to be 90% percent better after his accident last September. He had serious injuries after being hit by a car, but the Vet's at Island Paws took great care of him during the surgeries and made him practically new! He has the slighest limp when he walks, but he still gets around very well. A few different people took care of Lil Bud the last few months, bringing him to the marina about 4 days a week to see everyone and hangout. When we let him out of the cage something just didn't seem right though. He seemed scared and was hesitant to roam around. And I can't blame him because it's a busy place, with lots of people and lots of cars. So we all asked each other "what would be best for the little guy?". Of course most of us wanted him to be the little king of Upper Matecumbe Key, but all of us worried that he might get hurt again. Lil' Bud was very lucky after his first accident, where he suffered a broken hip socket, a shattered pelvis, and ligament damage in his legs. So we were faced with the decision of letting him roam the docks or finding him a a good home. After a few weeks of contemplating we thought it would be best to give Lil' Bud the safer life in a home environment, and we found the right person for the job! The secretary's daughter absolutely fell in love with Lil Bud after taking care of him the last 6 months on and off, and we knew he would get plenty of attention and affection over the upcoming years by the young high school girl. She also has a few other pets and he gets along great with them! I hope everyone is happy with the decision that we have made, and we want to THANK EVERYONE that helped him get his surgery and really gave him a second chance at life! We haven't forgot about Lil Bud's mom either. Mama Mary has made herself right at home. She gets lots of attention while relaxing in the tackle shop most days. She's not as adventurous as her son, so we think she will have a long happy life on the docks. Once again thanks to everyone who helped Lil' Bud out, and we hope you think we made the right decision with Lil' Bud's future home. If you're looking to expand your fishing knowledge or load up on some new tackle, swing by Capt. Harry's Fishing Supply in Miami on Saturday March 29th! Capt. Nick Stanczyk will be talking about daytime swordfishing! Bud n' Mary's sweeps the Gold Cup Sailfish Series! Yesterday was one of the most exciting days here fishing in Islamorada in a long time. It was the one day winner take all Islamorada Fishing Club Sailfish tournament, which is the last leg of the Florida Keys Gold Cup Series. The sailfish bite had been pretty tough this past week, with just a handful of fish caught between all of the charter boats at the marina each day. Yesterday though, some of the guys were in them! Capt. George from the Reel McCoy, would take first place on private boat Swagger, with 7 releases. Second place also had 7, which went to Last Dance. With 10 minutes to go in the tournament, team Relentless would hook a double header. They wound up catching both fish, to give them 7 releases for the day and put them in 3rd place for the Fishing Club Tournament. Going into the day we had the Catch 22 leading the Gold Cup Series with 30 releases, followed by Relentless with 26 and Swagger with 25. Capt. Scott on the Catch 22 released 1 sail early yesterday to go to 31 overall releases, but then lost the next few fish. At 3 pm Capt. George on the Swagger would jump to 32 releases. At 3:50 p.m. it was looking like George and his team were on their way to their first Gold Cup Championship, but then Relentless hooked up. First a single, then a double. But they lost one quickly. But then a minute later they were back to a double header. They released one of the two and were tied with Swagger, but they still had one fish on the line. Lines were out of the water now, but you could still fight a fish after lines out if you were hooked up before 4 p.m. Well at 4:17 pm Relentless released their last sailfish, giving them 33 releases overall in the Series, and Capt. Paul's 5th Gold Cup Championship! Great Job to the Bud N' Mary's Boats taking first, second and third place to sweep the series! Copyright © 2014, Bud N' Mary's Fishing Marina. All rights reserved.